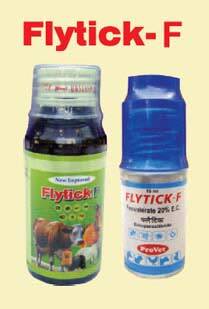 add 2- 6 ml Flytick F Liquid in 1 litre of water and apply the prepared solution thoroughly on the animal body. In cases of heavy infestation,it is desirable to repeat application after 1 hour. For effective control add 15 ml Flytick F liquid in 3 litre of water and spray this highly concentrated solution in the cattle sheds especially in the cracks and crevices. In highly infested areas it is advisable to repeat the application after one week. Mix 6 ml per litre of water and spray as an aerosol in the sheds and surroundings to control flies.